Maine writer J. Marsha Michler wrote an extensive post on taking the winter 2011 Purely Post and Beam class with Gil Harris on their blog, "The Existential Gardener." It's a great overview of what it feels like to take the week-long class. There are new tools to learn, old skills that need dusting off, and it's lots of fun. In particular, I like the photos of the bloggers at work on cutting beams, sharpening chisels, and the class assembling the frame. 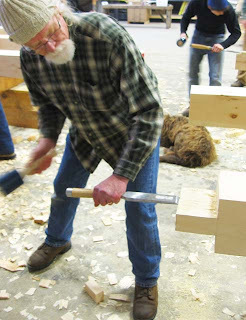 Here's an example of Gil finishing a tenon from their blog. "The Existential Gardener" blog chronicles "the experiences and recipes" and "other related stuff" of their all-season organic garden. A recent post offers a recipe for green bean casserole that looks delicious. Please visit and subscribe to their blog. If you're inspired by Gil and Marsha and want to enroll in the next Purely Post and Beam class, we're currently accepting applications for our January 22-27, May 6-11, and September 24-28 courses. Looking for something to do this weekend? Come and visit Shelter at the Brunswick Outdoor Arts Festival. We're raising a timberframe on the mall (i.e. the grassy area on Maine Street in the middle of downtown), and we'll also have lots of tools, books, and Shelter staff on hand. Downtown Brunswick is also a great place to spend your Saturday. The Brunswick Downtown Association (BDA) will present its fifth annual Brunswick Outdoor Arts Festival on the sidewalks of Maine Street and on the Brunswick Mall from 9 a.m. to 5 p.m. Saturday. More than 100 artists and artisans are expected to take part in the juried art festival, which will feature painting, sculpture, mixed media, graphics, drawing, photography and fine crafts. Awards will be presented to the Best in Show, People’s Choice and Best in Category. The festival also will offer theater performances, dance teams, mimes, weavers, and live music on a stage area in front of Bank of America on Maine Street. JimmyJo and the Jumbol'Ayuhs will perform from 10 a.m. to noon. Swing a Cat is scheduled to perform from noon to 2 p.m., and Bits and Pieces will take the stage from 2 p.m. to 4 p.m.
Roving musicians will perform along Maine Street and on the Brunswick Mall. David Bullard will host a Maine Summer Songfest concert at the Brunswick Mall gazebo from noon to 3 p.m., with the Latin band Soundwavz, Shanna Underwood and Lauryn Hottinger. Activities for children include face-painting, balloon art, interactive music with Sharon Pyne, juggling and hula hooping. The Shelter Institute plans to raise a barn frame and provide an opportunity for visitor participation. 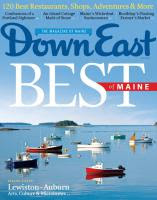 For more information, contact the Brunswick Downtown Association at (207) 729-4439 or visit www.brunswickdowntown.org. Flexcut, our supplier of fine carving tools, is offering two levels of rebates on all of their tools. The first rebate offers $5 cash back when you buy $50 in Flexcut products. Download the $5 rebate form here (PDF). The second rebate offers $10 cash back when you buy $100 in Flexcut products. Download the $10 rebate form here (PDF). We carry an extensive collection of Flexcut tools at the Shelter Store. Their palm tools are excellent, and we carry the tools in sets or individually. On our website, you can purchase the Skew Gouge Palm Set. 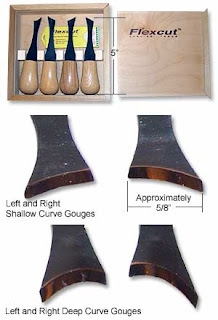 The set comes with a shallow curve, deeper curve, left-skew, and right-skew gouge. Carving will never be the same with these four palm gouges. Reach into the inner right curves and the inner left curves to create symmetrical patterns and designs. These gouges are sharp—so sharp that FlexCut includes a box of Bandaids with each set as a gentle reminder to be careful! The rebate is valid until July 2012. If you've made a recent purchase of a Flexcut tool, it will probably apply. The Flexcut website also has some handy diagrams that show how to sharpen these tools. As mentioned above, they come really sharp from the factory, but once you use a really sharp tool (and notice the difference), you'll want to keep that edge maintained. If you're new to carving, we sell a great two-part workbook on decoy carving, Decorative Decoy Carver's Portfolio (Series One and Series Two). For some vacationers, lying on the beach just isn’t their definition of relaxation. The one- and two-week courses offered by the Shelter Institute represent a great way to enjoy the Pine Tree State and gain some valuable skills at the same time. The one-week Purely Post and Beam class, to be held August 7-12, teaches up to twenty-two students how to build a 24’x24’ post-and-beam cabin. (There were still a few spots open when we checked, but don’t wait to book your spot!) The class also gets to enjoy off-hours events like a lobster bake on the banks of the Sasanoa River. This might be one vacation you can actually claim as a deduction! We're very honored to be recognized by such a fine magazine. In the summer, students enjoy a fantastic lobster bake, campfires in the woods, and spend their free time sailing or kayaking. In winter, you'll have access to snowshoeing or cross-country skiing on the quiet trails around Shelter. We have a large indoor production facility at the Shelter campus, where the January Purely Post and Beam class builds a timberframe. It's a great vacation, but it's also an extraordinary opportunity to learn valuable and life-changing skills. 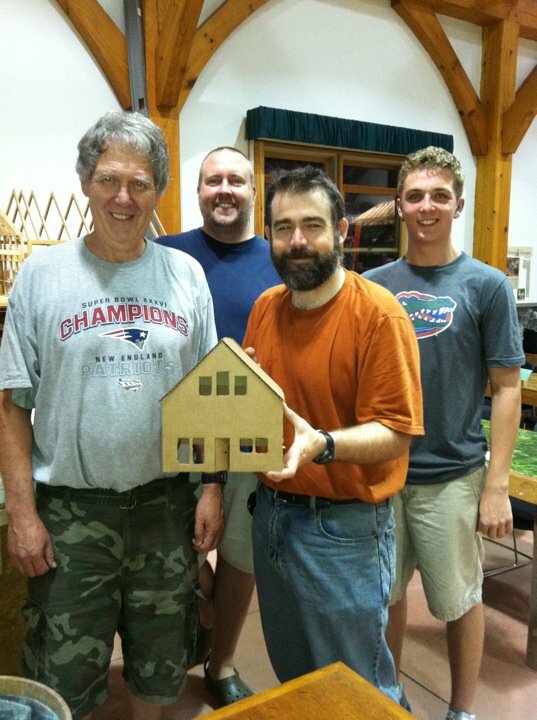 This summer's two-week Design Build class ended recently. Students came from near and far to learn about a house as a complete system. Some will venture off to design and build their own home, others will engage with builders and contractors with a greater understanding of the building process, but everyone will leave with confidence—knowing more about the complex but understandable places we call home. Shelter is lucky to have many thoughtful and engaged customers. They know what they like and what they don’t like. Best of all, they are great at sending us their reviews, so we can pass their thoughts on to others. 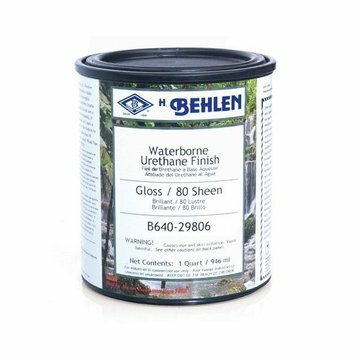 One such customer from the Virgin Islands recently called us, gushing about the Behlen’s Waterborne Urethane Finish we carry. 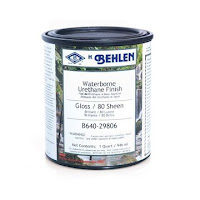 She couldn’t say enough good things about the stuff—that it was ”really easy to use,” low on VOCs (Volatile Organic Compounds), environmentally-friendly, dried quickly, and created a harder, more durable finish than other finishes she had used.